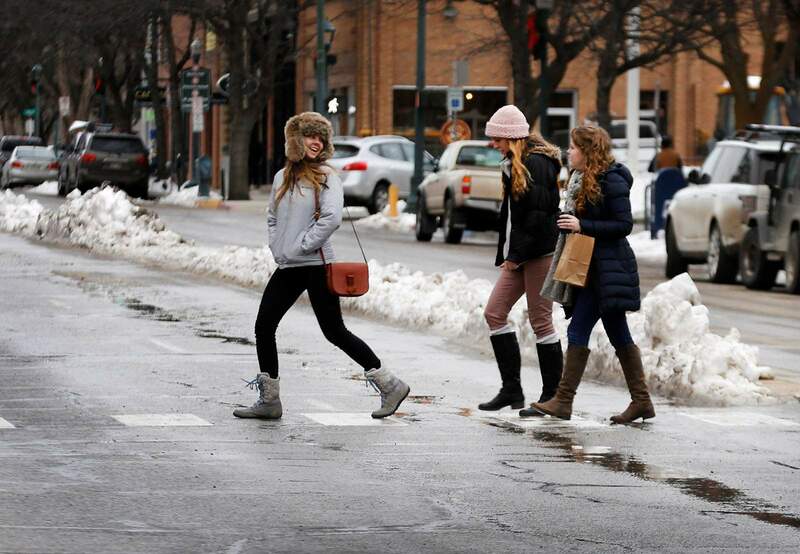 A berm of snow occupies the center lane of Main Avenue on Friday in downtown Durango. The pile of snow made it tricky for one woman to run across the street to pay a parking meter. The city says it may not have enough money to keep removing snow this winter from downtown. The city of Durango may run out of money to remove loads of snow from downtown streets if the snow keeps piling up like it has been, city staff said this week. Available funds for snow removal are dwindling, said Levi Lloyd, director of city operations. Potentially insufficient funds are a product of “systematic” cuts to the city’s snow-removal budget, he said. The snow-removal budget has been reduced by almost two-thirds in the past three years, Lloyd said. After a heavy snow, plow drivers push the snow into the middle of Main Avenue, creating a berm from Fifth Street to 13th Street. After a few days, city crews use a massive snowblower of sorts to load up dump trucks that carry away the hard-pack material to a site where it can be piled high for the winter. The city had about $47,000 in its snow-removal budget at the beginning of this winter, Lloyd said. Just a few years ago, he said the budget was around $120,000. “These are the budget cuts people say we need to make that people may not be seeing,” Lloyd said. City Manager Ron LeBlanc said the snow-removal budget was cut because winters are uncertain. Other services that could have been cut in its place, like lawn mowing for parks or striping for streets, will always be needed and do not depend on the weather, he said. The city has been plowing snow to the center of Main Avenue in downtown Durango but keeping the crosswalks clear. It costs the city $8,000 to $10,000 per night to remove 150 to 200 dump truck loads of snow. And the snow removal budget shortfall shouldn’t come as a surprise, LeBlanc said. The city has been saying for at least a year that it doesn’t have enough money for capital improvement projects and has been cutting services as a result. It costs the city anywhere from $8,000 to $10,000 a night to remove 150 to 200 dump truck loads of snow from downtown Durango. As of Friday, the fund had about $29,000 remaining after spending three nights removing snow earlier this month, Lloyd said. The money in the snow-removal budget is used to rent dump trucks from local contractors to remove the snow, he said. City Operations has four of its own dump trucks, but must contract 10 to 12 more when it needs to remove snow from downtown streets, he said. The city was in a similar situation in winter 2008-09 when it ran out of money to remove snow from downtown streets. But city staff went to City Council and asked for a special appropriation from the fund balance, or savings account, and got it, Lloyd said. Staff members don’t have that option now, he said, as the city’s general fund balance is strapped for cash. 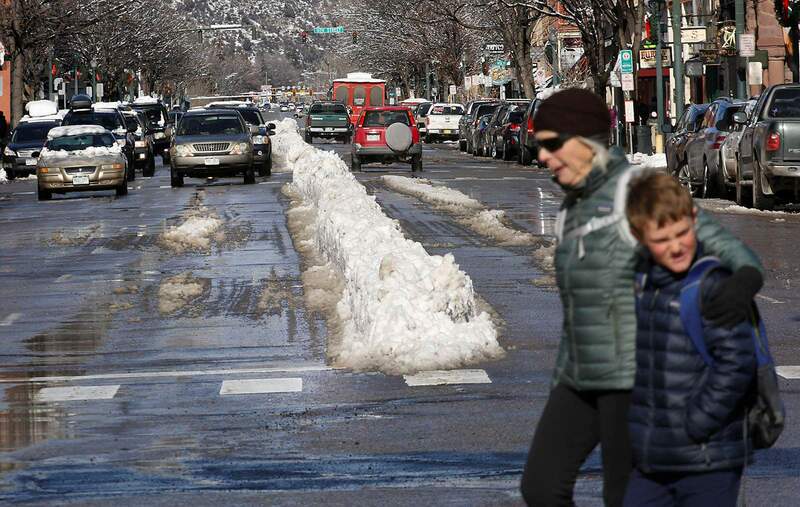 The city of Durango is running out of money to keep removing snow from the center lane on Main Avenue. Restoring the city’s contingency account could solve the problem the city is facing, LeBlanc said. If the city had a contingency, it could move money around like it did almost a decade ago to pay for snow removal. The city has proposed two 0.5 percent sales tax ballot questions for City Council to review that would restore a contingency account. Mayor Sweetie Marbury said snow on the streets won’t keep people from shopping or dining out. Durango is a snow town, and people learn to live with it, she said. Tim Walsworth, executive director of the Durango Business Improvement District, said the snow removal from the downtown area is “super appreciated.” But without that service, the downtown district, which accounts for about 33 percent of all sales tax revenue in Durango, could be strapped. Leaving the snow in the streets narrows Main Avenue, effectively turning it into a two lane street, Walsworth said. Snow piles limit parking, he said, and make it harder to get around on downtown sidewalks. The difficulty in navigating downtown could create a vicious cycle, Walsworth said: Fewer people going downtown means less revenue for the city, and less money for snow removal. LeBlanc said he can follow that line of thinking, but he believes it is a bit more nuanced. More snow brings people to town and keeps others away, he said, possibly making it a wash.
“It’s a wicked problem. It’s one of those things we’ve been talking about for two years,” he said. Walsworth said the BID could work as a coordinating partner in getting businesses to rally and remove snow themselves, but doing so is a monumental task. Removing snow requires heavy machinery that is not cheap.